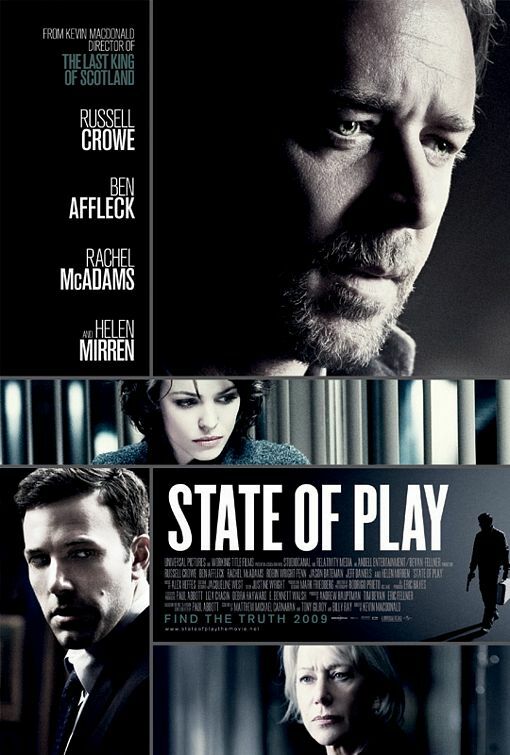 State of Play, the movie, depicts journalism as journalists might like to see it. A fearless press (and here we mean a newspaper) exposed corporate corruption, defied the police and conducted investigations which resulted in a politician being charged with murder. I saw State of Play at a preview staged by the Journalists’ union, the Media Alliance. The theatre was stacked with journos who groaned and laughed knowingly as an initially vacuous gossip blogger was confronted with the inconvenient need to find the “facts” required by “real” journalism. They were delighted when a Corporate PR type was exposed as a cowardly, Cadillac loving shill, obsessed with money and concerned only with self preservation. They could identifty with a suitably unkempt Russell Crowe, the street wise reporter, Cal McCaffrey, who a cultivated a world of low life sources, slugged “Irish wine” (whiskey) and kept an old photo of Woodward and Bernstein pinned to his wall. I think I might have seen him myself at the end of a bar somewhere, some time ago. The movie was based on a six part BBC series where McCaffery was played by John Simm whose Life on Mars was similarly homogenised for the American market. In the movie, the series’ elegant and cynical editor, Bill Nighy was replaced by the blunt and bluff Helen Mirren who, as editors do, swore appropriately and with great dexterity. The distinctly wobbly and compromising British newspaper management became an off screen corporation with its eye on the bottom line. The new corporate villain, Pointcom, was naturally intent on destroying democracy as we know it while taking over the bits of the world that mattered (Washington). No understatement here. The American version was quicker, tighter, shed more blood, had more guns and was a good deal more obvious than the original. I guess you had to expect that, British and American cultural sensitivities being what they are. However, State of Play explored the moral dilemmas faced by reporters investigating complex stories. McCaffery relentlessly unravelled the stories’ threads, invading privacy, bribing police, bullying witnesses and withholding evidence. He did so while confronted by the larger evils of corporate fraud, political corruption, betrayal and murder. “This is not a story! It’s a case!”, said one of the befuddled and frustrated Washington coppers.